Computer network is an integral part of our daily lives, with the most important reason being that of communication. The use of computer networking is to share resources like fax machines, printers, modems, files etc., and its other uses are database server, computer server, email, chat, internet etc. The computer to which the resources are attached is called the server and the other computers that access the resource are called clients. In peer-to-peer computer networks there are no servers. The sharing of fax machines, printers, and modems amongst many computers and users reduce the operational cost. A database on a computer network is a very important application as it stores and runs many important data and jobs. Emails and chats can be used for instantaneous communication and sending of files on a computer network. 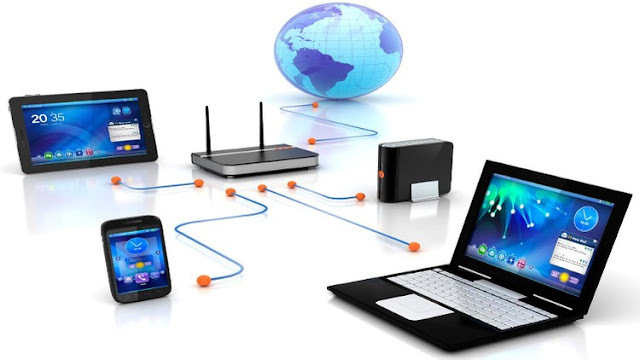 The computer networks are classified, depending upon the size, as Local Area Networks (LAN), Wide Area Networks (WAN), Metropolitan Area Networks (MAN) and Personal Area Networks (PAN). The topology (topology is the way the computer networks and network resources are connected) of the networking can be classified as Bus Network, Ring Network and Star Network. The networking hardware basically consists of wiring, network cards and a hub. Computer network cards are required so that one computer can understand what the other computer is “talking”. Network cards have a unique MAC address to identify computers on a computer network. Hubs connect all the computers in the network. Hubs can also be used to connect to other hubs to increase the size of the computer network. Two computers can be connected using Ethernet cards or phone lines or power lines for communication, with hardware kits available at roughly a cost of $100. As the number of computers in an office or a home increases, so do the number of cables, so wireless networking is a viable solution. In wireless networking radio transreceivers or infrared signals are used to communicate between computers and devices. Examples of wireless networking include Wi-fi and Bluetooth technology, though there may be security issues involved in wireless networking. However there definitely is a stronger preference towards wireless networking nowadays among consumers. Computer networks have added a new dimension to the 21st century. Today the cyber world is much faster and wider than the real world. This has all been made possible due to computer networks. Computer networks have revolutionized business, communication, travel, research, defense, society and almost all human endeavors. The evolution of computer networks has helped the technological revolution take a big leap forward. 0 Response to "Computer Networking Fundamentals"